The hot dog booklet is a perfect format for a small size comic book. 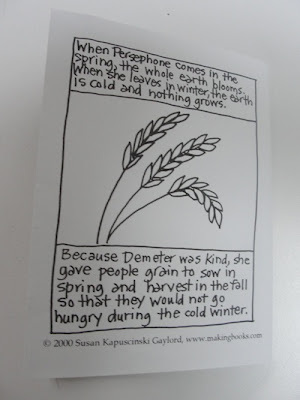 I first had the idea when I included it in Multicultural Books to Make and Share in 1994 and then adapted it for recycled materials for Handmade Books For A Healthy Planet. 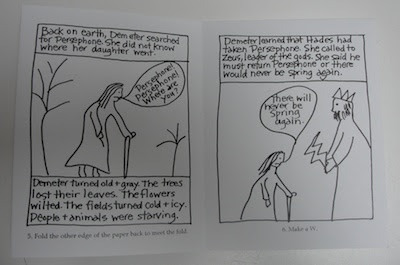 I also made pre-printed 11 x 17 sheets that I used in teacher workshops so they could have a finished book to show. It has the directions along the bottom of the pages. Over the past several years I have been moving away from teaching in schools toward bookmaking out in the community and my own work. It has been a slow process. In the past month, I realized that that chapter in my life has in fact closed. While I still do workshops and talks at teacher conferences and meetings, I will no longer go into individual schools. As I am starting to make changes in the studio to better suit my new projects, I find that I have materials to pass along. 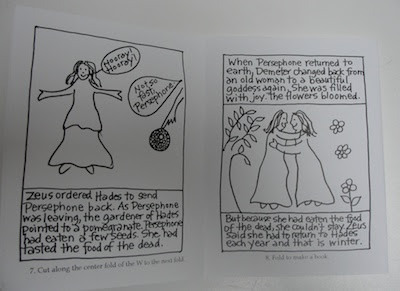 I have 5 sets of the Persephone sheets to give away. Three are sets of 30, one is 20, and one is 19. If you would like one of the sets, please leave a comment (indicating which count you would prefer) and I will make a random drawing. Entries will close Thursday at midnight. I am going to use some ideas from your book (Handmade Books for a Healthy Planet) to teach a summer school class at the end of June. I would love the set of 30 Persephone sheets. I also purchased some of your ebooks and I'm looking forward to seeing what my students will make this summer. Thank you for sharing your ideas. 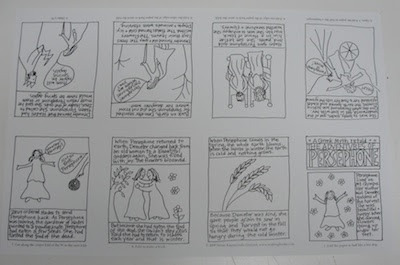 I would love to share the Persephone books with our students and would make good use of any of your sets. I have greatly enjoyed making your books. Thank you for sharing your ideas with our community. I often make your books with my students and would love any of the sets. Thank you for sharing them with us. 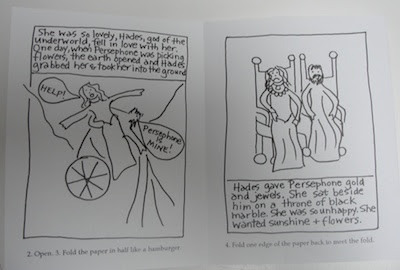 Susan, this is such a creative way to present a story..
Just wondering if there will be any draws for a single booklet? Would sure like to enter my name. As you are changing directions, just like to say thanks for sharing your works along the way. The internet has certainly enabled that kind of networking. Handmaking books from reused materials has taken a hold here & provided a great outlet for creativity. Best with the community focus! My husband and I are both MOntessori teachers and we are just about to complete the first school year of our new school in central CA, Cottage Montessori. Your multi-cultural book making is so inspiring with endless possibilities!! We would love to have any set from your drawing! As I continue to reorganize I have something to send everyone if not the Persephone books. If you did not put your email address in your comment, please make another comment with it or email me directly at susan (at) susangaylord.com. If anyone particularly studies Egypt, please let me know as I have a project for that. 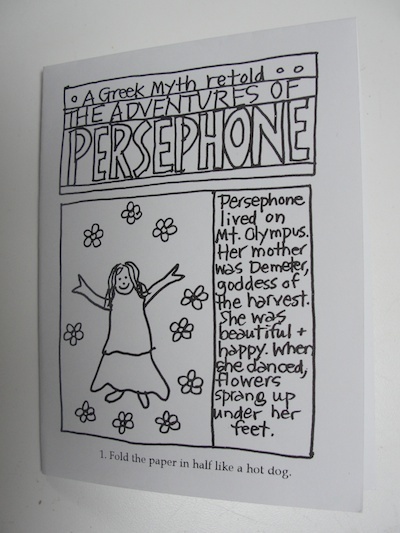 I am a fourth grade teacher and myths/legends are one of the genres we teach. I'd love to have a set of the sheets to use. Hi Susan, I'm up for a single something as you clean and clear. If there is enough to share. As you know, I am a big fan (and not just of your fan books!). I'm a fourth-grade teacher who blissfully loves your books & videos. I especially love your ebook about multicultural books. I integrate these valuable skills in all the content areas & my students continue to create their own books at home! Please send me a Persephone, Egyptian, and any other available set. The giveaway is over but I am placing more things from the Studio Clearing on etsy. They're still free but you'll be paying for the postage.